Today, you can grab the wire-free version of the Circle 2 for $129.90, $70 off its MSRP, and the wired version for $139.99, $40 off. Both are great discounts, though we've seen the wired model go this low before. If you're wondering what you'll get with the Circle 2, here's a quick rundown: 1080p video with a 180-deg field of view lens, night vision, and weatherproof build on the hardware front. From a software standpoint, two-way conversation are supported, you'll get a time-lapse briefing of your day, and smart alerts get sent to your phone when motion is detected. 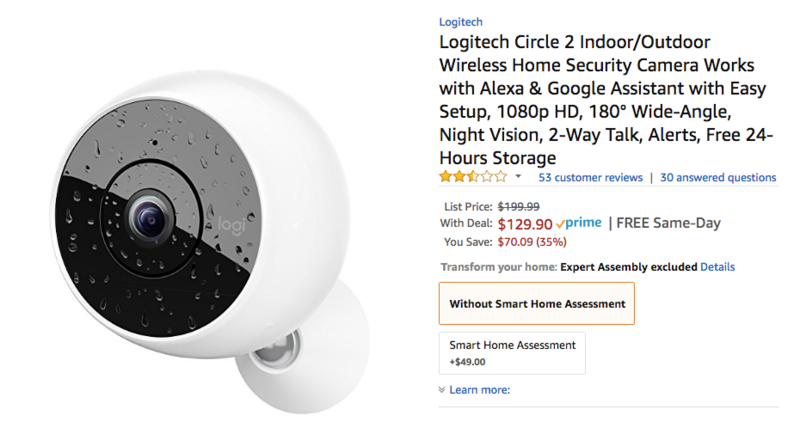 The two requirements I mentioned at the start of the article are there: the Circle 2 works with Google Assistant, Amazon Alexa, and Apple HomeKit, and you can use it for free if you're OK with 24hrs of cloud storage. Upping that to 14 days costs $3.99/month, whereas 31 days with support for person detection and motion zones will net you $9.99/month. The difference between the wired camera and wire-free one is that the latter comes with a three-month rechargeable battery and has been less favorably reviewed overall. If you're interested, grab either one from the links below.